With the Christmas shopping season fully upon us, Microsoft’s Kinect motion-sensing game device is expected to be at the top of the gift list for many consumers. Last year, Microsoft sold 1 million Kinect devices for its Xbox 360 in 10 days, and in a recent poll it was at the top of the wish list for children 13 and older. But what you might not expect is that some of those orders are going to be coming from businesses. Early this month, Microsoft launched Kinect for Windows SDK with a brilliant, new ad called “Kinect Effect. At the time, Microsoft had set out to change that course through an expansive and expensive relationship marketing initiative. Internally, it aligned marketing with product groups, created a “mea culpa” marketing campaign to reach out to past customers, and targeted loyalists hoping to turn them into advocates. But because of its past transgressions, and a perception that many of its products were “necessaries” with little to pique the desire of consumers, Microsoft struggled with finding an ignition point, or something to connect customers with the brand and ignite their passions. Well, those days appear to be over. With the Kinect Effect, the tech titan proves that it can be relevant, even desirable, with a campaign that is expansive, inspiring and incredibly human. The campaign asks audiences to dream about how they might use Kinect by inspiring them with images of people playing air instruments, a doctor flipping through X-rays, and a student deconstructing DNA with only hand motions. The expansiveness of the idea allows Microsoft to reach, and hopefully inspire, all three of its targeted audiences, including consumers/users, businesses and developers. Any one group can have the dream, but all three are needed for it to become reality. Perhaps the most significant point of the ad is that it’s proof that the relationship marketing effort was a success, Microsoft now understands the strategic importance of the “front end” as Ballmer calls it. Five years ago the message of the commercial would of been about the “bells and whistles” of the Kinect device. This ad is an elegant and visually stimulating vision of what Kinect can enable, the virtually unlimited imagination of dreamers. If Microsoft can continue to build this connection with the customer while retail store openings roll-out into 2012, it could transition itself from the company that makes the “have to have” product to the company that is the “want to have” brand. It was written 235 years ago. Between 200-300 copies were printed for towns up and down the east coast, and a few made their way to Europe. Contrary to popular belief, the original copy contained no signatures and what it promoted was completely unique, new and…flawed. The Declaration of Independence may very well be the world’s most famous press release. That’s according the curator at Independence Hall in Philadelphia, where it was written and approved in its final form (unsigned) on July 4th, 1776. The signed copy we are familiar with was created later for ceremonial purposes. This history lesson is an important best practice from the Founding Fathers. How many times have you written and/or read a press release that tried to say too much, or that lacked clarity on its objective? Another interesting point from our visit was the struggle to form a new federal government (the “How”). Under the Articles of Confederation, the new federal government had no revenue source (taxation), and no real authority over the states. The states were sovereign, operating essentially as their own countries making decisions on their own currency, religion, and diplomacy with other countries. Again the marketer in me saw the similarity to the power struggle between corporate marketing and other sales/marketing organizations (Product, Field, Region, etc.). Would history provide another lesson for marketers? Addressing the religious issue was easy; they left it out of the Constitution. It was later covered under the Bill of Rights. On slavery, they reached a compromise by outlawing slave trade in 1808, twenty years in the future. But the single most important change was the shift from states to the individual in granting the federal government its power. The federal government now answered to citizens, not the states. State representatives and congressmen now represented the views and best interests of the people within their districts. By putting citizens first, the founding fathers established a focal point that transcended state interests. Lesson: With the rise in social media adoption, marketers now can better gauge the direct needs and desires of their customers. Customers for their part are showing a willingness to engage like never before. Marketers are presented with an opportunity to shift focus from solely addressing and satisfying internal “state” needs to anticipating, engaging, and serving the needs of “citizens” … customers. Is it time for a marketing revolution? Although I’m a proud Virginian, I’m no Patrick Henry but I say marketers, it’s time for our own declaration … marketing by the people, for the people! Owners of the MINI-Cooper have long been known to be one of the most fanatical and loyal of all call owners. They are likely to custom design their cars online, actively participate in local motoring clubs, and are in general, a passionate and faithful community. A new project took me to the mid-west and I finally got a taste of the MINI-Cooper, courtesy of Budget rental cars. Initially, I was excited by the opportunity to find out what the buzz was about, but after getting in the little red car with white racing stripes, I quickly found myself totally discombobulated. It was like the car was designed by aliens, nothing was where it is should of been, and the layout, among other things still remain a mystery to me. I couldn’t operate the windows the first half of the day, drove around with my blinker on for the other half. The radio settings were in the speedometer, and the tachometer was where the speedometer should have been. Even the gas gauge wasn’t a gauge at all, but rather a circle of lights. The “Coop” had all the same instruments any other car has, but they were in different locations and/or in different forms. I’m still not convinced if the lay out of the dashboard is better, but one thing is true — I was fully engaged, I had to be. Even though I’ve been driving for almost 30 years I was a stranger in a strange land. Suddenly, driving was fun again. We have seen traditional response rates drop, and have begun experimenting with Social Media with little, to no, payoff. Although the true upside of customer engagement may still yet to be defined, a Gallup research report points to it as a leading indicator for customer attrition. In some ways we’re searching for the Holy Grail, but maybe new isn’t the answer, maybe we have what we need. 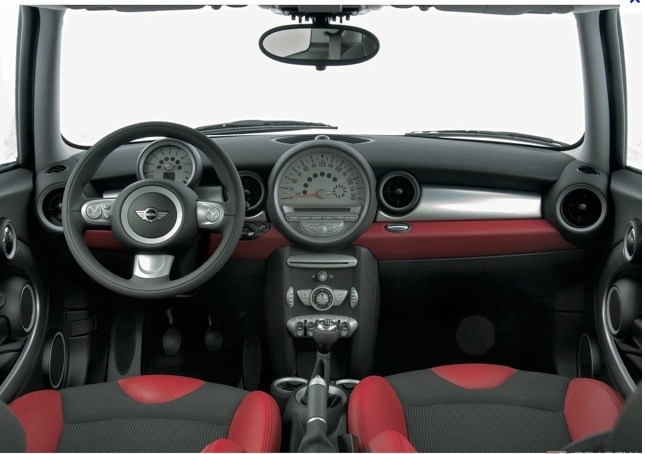 As I sat at a stoplight and stared at the dashboard trying to make sense out of it, it hit me: It was if the MINI engineers intentional redesigned and/or rethought everything, most likely with the intent of keeping the Coop customer base happy and engaged with it’s quirkiness. It showed me that you could create an engaging experience by leveraging what you already have. Granted, had I been on a tight schedule, I may not of enjoyed having to “get up to speed.” I was in a city that I had never visited and driving to see a client I’ve never met. I had my hands full directing the GPS, a stick shift, and a conference call. I am not suggesting rearranging mission critical assets for key customers but what I am offering is this…maybe we need to rethink how customers engage and interact with our sales people, customer service reps, and the web. Like the engineers at MINI, we need apply our creative thinking skills to reordering our assets to provide customers with what they want, but delivered in new and intriguing ways. At the end of the day the MINI still provides basic transportation – I got from point A to point B, but getting there was uncomfortable, scary, exciting and fun. Much of what we provide customers is basic “transportation,” and “mixing it up” can be scary, but it also may be the key to getting customers’ attention again.